A portable swim pace clock can be a useful tool. When you’re competing, chances are you’re thinking about beating the clock every time. However, it’s also important to use a portable swim pace clock when you’re training as well. The use of an Accusplit swim pace clock will help you improve your technique and speed, as well as increase your level of fitness to further enhance your performance. You will be amazed by what these devices can do for you. Reading summer swim team portable pace clocks is different than reading your typical clock. Learning how to read it properly will ensure you always know just how fast you’re swimming and will allow you concentrate on your technique. When you have an analog portable swim pace clock, the black hand indicates the number of minutes, while the red hand ticks off the seconds. These clocks can be easily reset at the beginning of each training race or at the beginning of your entire session. it all depends on what you are tracking. 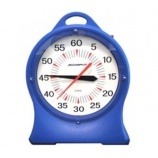 Of all the competitive swimming equipment, an Accusplit swim pace clock may not seem like a top priority. However, there are good reasons to use them. These clocks are extremely efficient in helping you gauge your overall pace time and determine your progress as you train for your next event. A portable swim pace clock can also give your workout more structure so you can be more productive in your training sessions. One of the primary purposes of these tools is to help you further develop your skills, while you improve your overall speed so you can perform at your peak. Summer swim team portable pace clocks may not be at the top of your list for competitive swimming equipment to buy, but it should be. These clocks allow you to easily see how well you are doing and can help you improve your speed, as well as your focus. Placing one at either end of the pool is a great way to time yourself between laps and get a clear view for how effective your training sessions are. If you’re looking for a portable swim pace clock to help you with your training, contact us. We carry all the competitive swimming equipment you need to become a more effective swimmer.